GoldGiftsCa - Craftsmanship Guarantee - All cleaning, soldering, and work done to this gold nugget has been done by a certified Goldsmith. This fantastic piece of jewellery has been commission through an extremely reputable jewellery store (open since 1961) and is deemed 100% genuine and authentic (Comes with their legally certified appraisal - See down below for more info). Do not confuse this with homemade jewellery, this is exquisite hand made artisan jewellery made by professionals. What EXACTLY will you receive: 1 x White and Metallic Gold Gift Box 1 x Genuine Natural Yukon Gold Nugget -This gold nugget has been hand picked and PROFESSIONALLY soldered to a 14kt gold bail. The nugget has been drilled and pinned, then soldered to form an extremely high quality and strong bond between the nugget and 14kt gold bail. This gold nugget and bail weigh a total of 1.340 Grams. 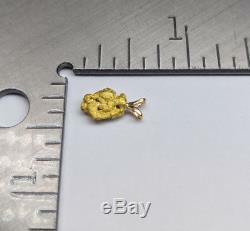 (Raw Nugget weight prior to addition of 14kt bail was 1.30 grams) -14kt Gold Bail Inner Diameter = 2.4mm x 1.6mm -The entire pendant measures 13.0mm x 7.2mm x 3.4mm. Certifies what we advertise is what you are actually getting. This Gold Nugget was mined from Bear Creek, Yukon, Canada. 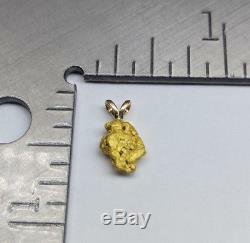 This listing is for the EXACT natural/raw gold nugget pendant in the images. This is the documentation that is signed and certified by an approved appraiser. It has been written and signed by a certified third party appraiser. If you have any questions feel free to ask us! For more pendants, necklaces, gold nugget jewellery and natural gold nugget samples visit our store GoldGiftsCa - Category menu located on the left hand side Always genuine natural Yukon gold nuggets and flakes. The item "Natural Yukon Gold Nugget Pendant Artisan Yukon Gold Jewellery A1" is in sale since Monday, May 28, 2018. 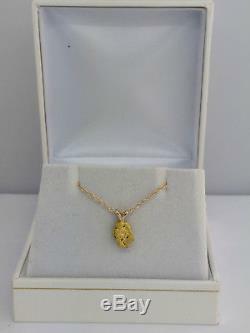 This item is in the category "Jewellery & Watches\Fine Jewellery\Fine Necklaces & Pendants\Precious Metal without Stones". The seller is "dbdb17" and is located in Squamish, British Columbia. This item can be shipped to Canada, United States.